The workforce in today’s society is continuing to change. As Boomers continue to retire, positions open up for new generations. The tail end of the Millennials has entered the workforce, which means the attention will turn to the next generation, Gen Z. According to LIMRA research, in fewer than ten years this younger generation with make up 20 percent of the U.S. workforce. People of all ages enter the workforce with stereotypes. Just like previous generations, Gen Z will likely be labeled before they have the chance to show who they really are. As employers try to predict what kinds of employees these younger workers will be, we recently took a look at what they want from their employers. Let’s take a look at three common myths about Gen Z and how what they are telling us is different than what you might think. Myth #1: Widely considered digital savants, Gen Z will be more interested in digital forms of communication in the workplace. Fact: Face-to-face communication is the top preferred form of communication at work for Gen Z. 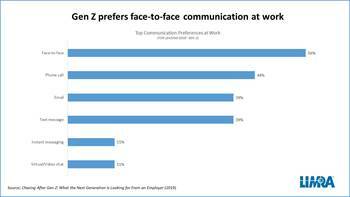 While this new generation is no stranger to technology, when asked what method of communication they prefer at work, 56 percent of Gen Zers favored in-person communication over any other form. 44 percent said they preferred phone calls and another 39 percent said email. Myth #2: : As tech-savvy employees, Gen Z will have more desire to work remotely or from home. Fact: Gen Z actually prefers to work at a company’s physical location more than previous generations. When surveyed, 36 percent of employed Gen Zers said that they preferred to work at the company’s location. This is more than Millennials (33 percent), Gen X (25 percent) and Baby Boomers (30 percent). Almost 4 in 10 unemployed Gen Z workers also said they prefer to work at their future company’s physical location. Myth #3: Gen Z will be more likely to embrace alternative work arrangements, such as the gig economy. Gen Z is not very different from earlier generations when it comes to their preferences at work and the way they communicate. Employers can use this research to help them recruit and retain Gen Z employees, and will be better able to integrate them into their business.